Internet-of-things (IoT) is increasing in excitement across all industries as they look to provide innovation in their product and services, and monitor risks and costs in their business operations. But IoT is not a single technology. It is an ecosystem of human and non-human touchpoints that span across multiple technologies. This creates a dynamic and complex environment that is difficult to see and manage in scope. The traditional monitoring approach of watching dashboards, responding to alerts, and manually analyzing doesn’t work anymore. 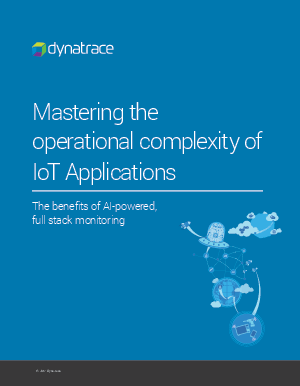 Today’s hyper-dynamic, highly distributed IoT application environments have become way too complex and move too quickly. The volume, velocity, and variety of information is simply more than humans can keep up with using traditional tools.